Surround yourself with the energy of the city at Courtyard New York Manhattan/Central Park. With world-class entertainment just steps away, our hotel makes it easy to explore top New York attractions including the Theater District, Central Park, Rockefeller Center, 5th Avenue and Times Square. If your visit is business related, our hotel features eight contemporary meeting venues appointed with audiovisual technology for successful events in the city. After a busy day, unwind with a complimentary yoga class in our full-floor fitness center, then socialize with friends or colleagues on the 4th floor before heading out to enjoy New York's nightlife. 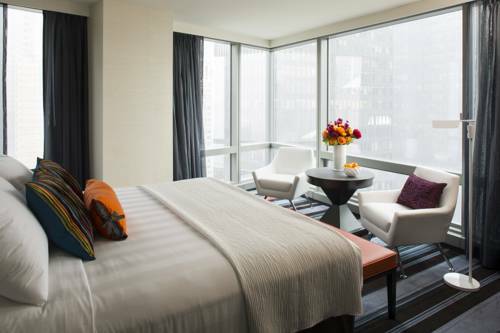 Our modern accommodations offer floor-to-ceiling windows with stunning city views, providing the perfect end to your evening. Stay active with our ergonomic workspaces and free Wi-Fi, or sink into our plush bedding. Whether traveling to the Big Apple on business or leisure, plan for an unparalleled stay at Courtyard New York Manhattan/Central Park. Your food and beverage destination for refreshing breakfast choices in the morning, and a variety of dinner and cocktail options in the evening. nosh also offers specialty beverages made with Starbucks� coffee to help you get a jump on the day. - Gershwin Theatre Broadway = "Wicked"